'Pandemic' Asks: Is A Disease That Will Kill Tens Of Millions Coming? : Shots - Health News Author Sonia Shah says that urbanization and air travel put the global population at an increased risk for disease. "Zika is a great example of how new pathogens are emerging today," she says. 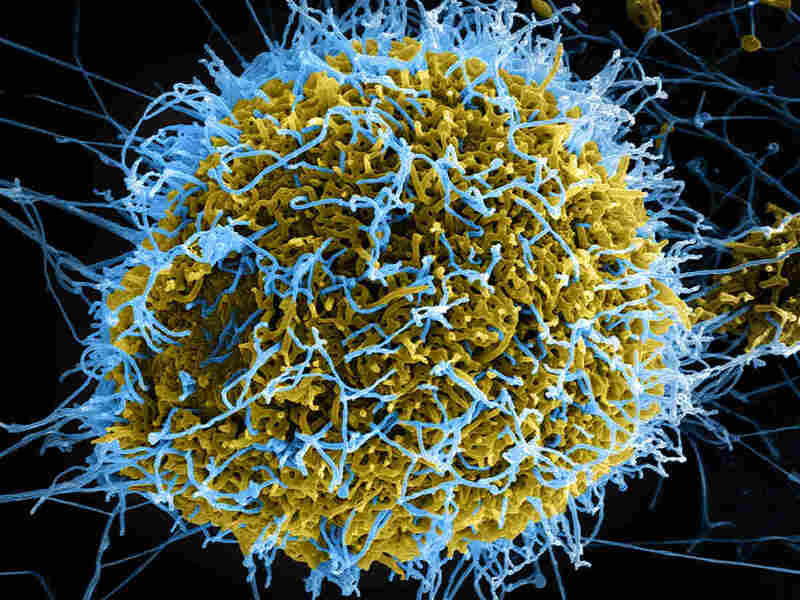 Ebola virus particles (blue) emerge from a chronically infected African green monkey cell. Citing a 2006 survey, Shah says, "the majority of ... pandemic experts of all kinds, felt that a pandemic that would sicken a billion people, kill 165 million people and cost the global economy about $3 trillion would occur sometime in the next two generations." 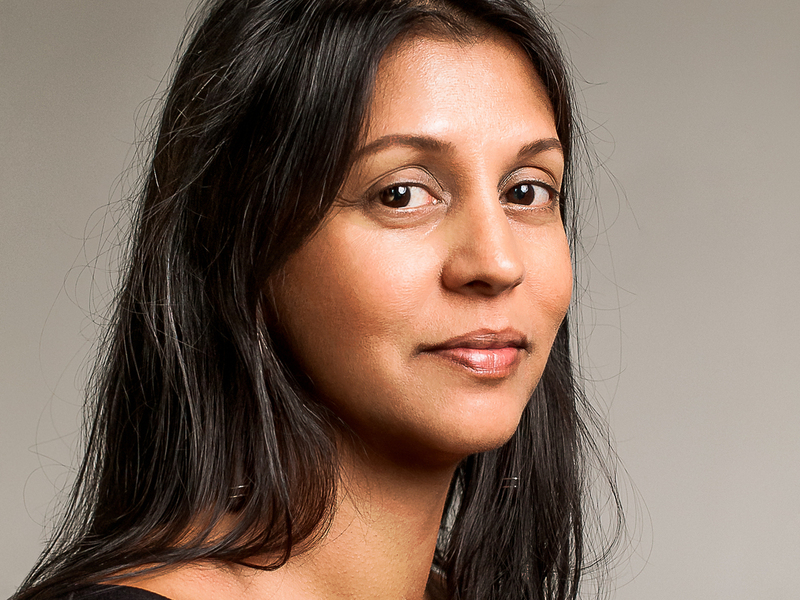 Sonia Shah is also the author of The Fever and The Body Hunters. 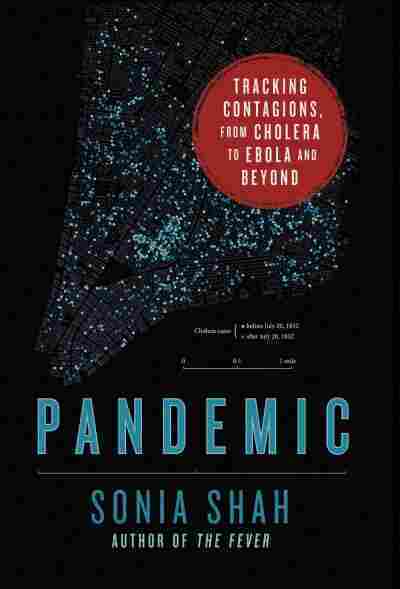 In her new book, Pandemic: Tracking Contagions from Cholera to Ebola and Beyond, Shah discusses the history and science of contagious diseases. She notes that humans put themselves at risk by encroaching on wildlife habitats. "About 60 percent of our new pathogens come from the bodies of animals," she says. Shah adds that international travel is also a factor in the spread of disease. "Air travel shapes our epidemics in such a powerful way that scientists can actually predict where and when an epidemic will strike next just by measuring the number of direct flights between infected and uninfected cities," she says. Looking toward the future, Shah says that epidemiologists can do more to identify potential outbreaks before they happen. But eliminating them altogether is another matter. "Our relationship to disease and pandemics is really ... part of our relationship to the natural world," she says. "It's a risk we have to live with." A lot of times when we talk about being more prepared in preventing pathogens from spreading or preventing pandemics, what we're really talking about is first response, stepping up our first response, so that when we have outbreaks of disease that our hospitals are prepared and we have vaccines stockpiled and we are able to fly our experts around really quickly to get to the scene of the outbreak, and things like that. But that's not actually preventing these pathogens from emerging and from causing outbreaks. That's kind of after the fire has started, then we rush in with our fire extinguishers. But to really prevent them would mean stepping it way farther back, and that is possible now, because ... we know there's certain places that have higher risk of pathogens emerging, and we can do kind of active surveillance in those places by mapping the microbes that are there, by surveilling people or animals who are more likely to spread or to have spill-overs of microbes into their bodies. ... We have more advanced detection capacity now with genetic analysis and other kinds of ways that we can see where these invisible microbes are spreading and changing. From bats, we got Ebola; from monkeys we got HIV, malaria, most likely Zika, as well; from birds we got avian influenzas, all other influenzas as well, West Nile virus, etc. So it's when we invade wildlife habitat or when we disrupt it in ways that brings people and animals into close contact, that their microbes start to spill over and adapt to our bodies. We don't know what the triggering event was that allowed Zika virus to start spreading into humans, but we do know what it exploited — and it exploited two things that a lot of other pathogens have exploited, too, which is urbanization and flight travel. So in the 1940s and '50s and '60s when we had Zika virus in the forests of Africa, it was carried by a forest mosquito and that mosquito very rarely bit humans, it mostly bit animals, which is why we didn't have a lot of Zika virus in people, at least it's one reason why. What we're seeing now is Zika virus has crossed over into a mosquito called Aedes aegypti, and this is a mosquito that has expanded its range over recent years as we have urbanized. It specializes in living in human cities. It loves garbage, it can breed in a drop of water in a bottle cap ... and it only bites humans. So once we had Zika virus coming into Aedes aegypti, this highly urbanized mosquito, that's when we started having this explosive spread. Of course, it traveled from Asia. It came out of Africa. It came into Malaysia, and then probably into the Philippines, Micronesia and French Polynesia. And that was the sort of slow spread, but then the rapid expansion happened when it came from French Polynesia into Brazil, and that was almost certainly through a flight, either people from French Polynesia coming to Brazil for the World Cup or possibly an international canoe race. But whatever it was, it was on a flight that it came over, and from there it's able to access these huge, highly urbanized populations and have no immunity, and that's what created the epidemic. We've known since antibiotics were first developed that if we use them in ways that were not medically necessary that it would lead to the evolution of resistant bacteria. And yet, in this country, 80 percent of our antibiotic consumption is not medically necessary, it's done for commercial reasons. We need to use antibiotics more rationally. We don't do that now. That's sort of the hardest part of it that we need to do. But the other part of it is we also need to develop new antibiotics to keep up — these pathogens are always going to evolve resistance eventually, so we always need to come up with new weapons to fight them. Lyme disease is caused by a bacteria that lives in rodents and is spread by ticks. Now in the intact northeastern forest where Lyme disease first emerged, there used to be a diversity of different woodland animals there, like chipmunks and opossums as well as deer and mice and other things, but as we spread our suburbs into the northeastern forest and we kind of broke up that forest into little patchworks, we got rid of a lot of that diversity. We lost chipmunks, we lost opossums, and it turns out that those animals actually control tick populations. The typical opossum destroys about 6,000 ticks a week through grooming, but the typical white-footed mouse, which is what we do have left in those patchwork forests, a typical mouse destroys maybe 50 ticks a week. So the fewer opossums you have and the more mice you have, the more ticks you have and the more likely it becomes that this tick-borne pathogen will spill over into humans. And that's exactly what happened with Lyme disease and now with many other tick-borne illnesses as well. Right now, a typical flu virus, the seasonal flu, will still kill a lot of people every year and it's a real drain on our global economy. But we kind of put up with that, so if you had a new flu virus that even had a slightly higher mortality rate, you could see a lot more death and destruction because so many people get the flu. Think about the 1918 flu, which killed maybe 100 million people, maybe more, estimates vary, but certainly huge numbers of people died from that flu. The mortality rate was like 1 percent, which isn't huge. It sounds like a small number, but when you think about how many people get the flu, that adds up to a huge number of deaths. So these new kinds of influenza, I think, are what virologists are most fearful of.